Sports are so arbitrary when you really think about it. It’s just a collection of athletes, exhibiting an arbitrary set of skills, governed by an arbitrary set of rules. You can throw a ball through a hoop? Good. You can throw it through a hoop behind this line? Even better. It’s the arbitrary nature of sports which leave me finding them rather meaningless at times. When a man throws an oblong ball and another man catches it, the action doesn’t directly affect anything in the outside world. Wars are still fought. Diseases still kill. A ball passing through space doesn’t alter race relations or alter prejudices. It’s just an object traveling through space. It’s this meaninglessness that makes sports the ultimate entertainment and ultimate distraction. You can engage with them as much as you want without approaching anything real. You can enjoy the success and follies of athletes without any real consequences. Even when a team fails, it’s a failure that we chose. We created the rules that define failure. Those rules are arbitrary, so failure must be arbitrary too. And yet, athletics so often become the medium through which we discuss issues larger than the sport. Athletics become a common language to which we can all relate. It’s a common language to use when we broach a subject from uncommon ground. 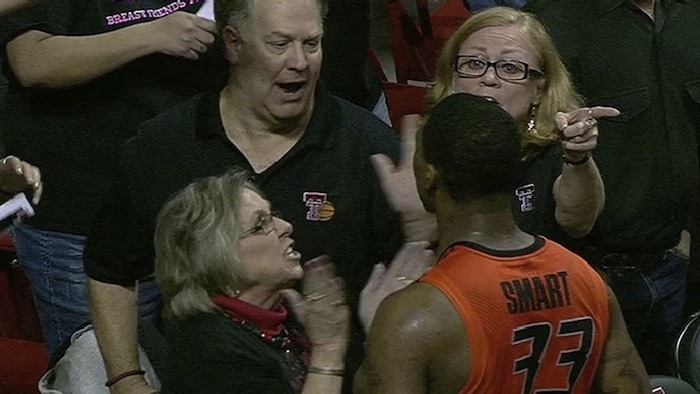 Saturday night, Marcus Smart pushed a fan in the waning moments of a basketball game. That is decidedly against the rules. That action drew the opinion of every talking head and pundit in sports media. That action was universally acknowledged as wrong. But the conversation didn’t end there. Race was immediately thrown into the fray. It was a young black male shoving an older white male. 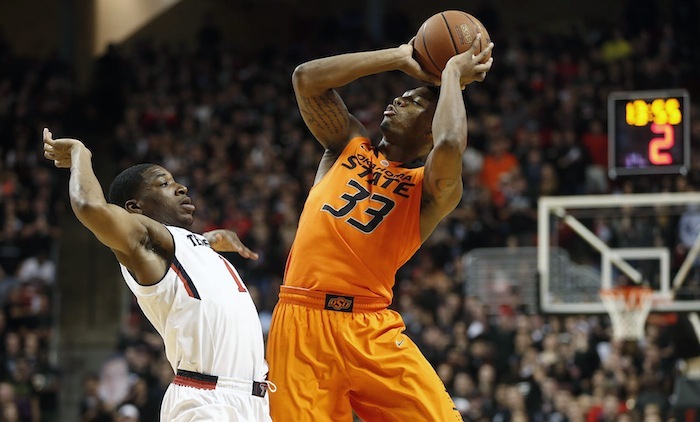 Rumors spread through social media that a racial slur was used, which provoked Smart. Suddenly, sports weren’t so meaningless anymore. The aftermath of this incident isn’t necessarily reflective of who Smart or the fan are as people. Rather, it’s reflective of where we are as a society. A black man pushes a white man, and there must be racial implications. Very likely there are racial implications here. Orr claims he only called Smart a “piece of crap.” Others are still reporting a racial slur was used. This argument will inevitably end in a stalemate of he said, he said. Either way, one thing is clear: race is still a topic that warrants discussion in our day and age. We still need better ways to understand each other and, more importantly, to respect each other. Whether this incident was ignited by race, we may never know for certain, but it certainly is being fueled by race now. That game isn’t meaningless now. Sunday night, I turned on my television to watch the Olympics. But when I found a figure skating competition whose outcome had been spoiled for me earlier by social media, I began flipping around to find something else. 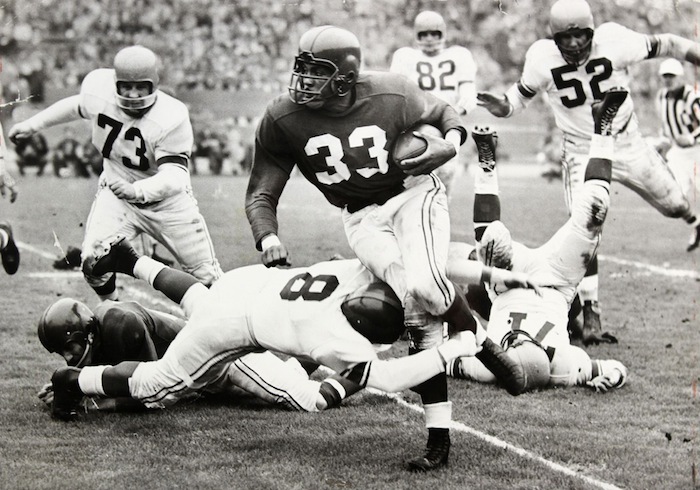 What I stumbled upon was a documentary on ESPN titled ’51 Dons about the 1951 University of San Francisco football team, which featured two black football players, Ollie Matson and Burl Toler. The team finished the season 9-0. They were invited to play in the Orange Bowl, but with one caveat: the team would play without its two black players. The team refused the invitation. By turning down the influx of revenue the school would have received, the football program was cut by the university for financial reasons. The players understood the repercussions when they made their decision and still chose not to play. That decision flies in the face of all the arbitrary rules we set out in our silly games. When you win, you keep playing. When you get invited to bowl games, you accept. You take the program-saving money. But the members of the USF football team didn’t want to listen to those arbitrary rules about football. They didn’t want to listen to those rules laid out by the Orange Bowl either. So they stuck together as teammates and listened to their own set of rules. The most meaningful game of their lives was the one they didn’t play. Unfortunately, the issue of race wasn’t injected into this story by the media. It was the story. Over 60 years ago, a collection of men stood strong in the face of prejudice and chose not to play a game. Back then, we didn’t have rules protecting players from racism and bigotry. Now we do. It seems those rules aren’t so arbitrary after all. When the documentary ended, I was ready to flip back to the Olympics when something caught my eye. A blinking graphic on the ticker alerted me to change the channel to ESPN2 for breaking news. There, I discovered that Michael Sam, a former defensive lineman for the Missouri football team, the 2013 SEC defensive player of the year who had declared for the 2014 NFL Draft, had announced he was gay. This makes him the first-ever openly gay NFL draft prospect. He’s on the verge of becoming the first openly gay football player in the NFL. There was a blinking red graphic that read “Breaking News” on the screen. I could almost hear all the bells and whistles sounding in the background. That’s all you really need to know about how the sports world handled his announcement. This isn’t to disparage ESPN or its coverage of the story. This is just where we are in 2014. When a man announces he is gay and that he wants to play professional football, that’s national news. The news wasn’t an hour old, and we were already dissecting how this will affect his draft stock. When we’re unsure how to discuss the social implications of a story, the ones that lay outside the field of play, we stick to the things we know. We talk about how well he can tackle, how quickly he can bring a man holding a ball to the ground. We talk about our arbitrary rules, as if a man’s sexuality would affect them. As a sports-loving society, we’re still not sure exactly how to handle the idea of a gay man playing sports. We’re even more scared of how others may mishandle it. We’re cautious not to presume the worst but not too naïve to ignore the dreaded possibilities. Unfortunately, homosexuality and gay rights are divisive issues in our country. Now we can talk about them as they relate to our games. This is only the first chapter of this story. 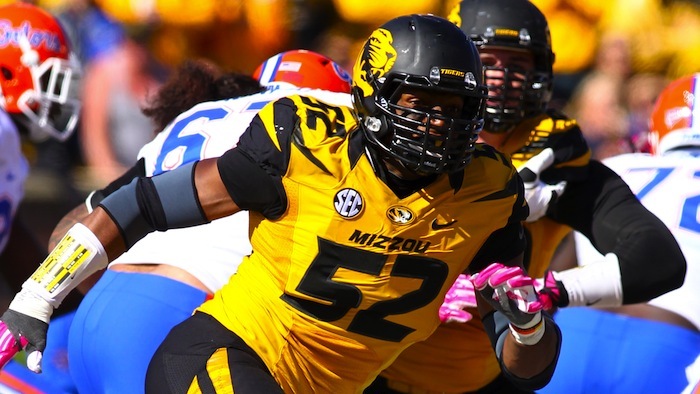 At this moment, all I know about Michael Sam is this: He is brave, and he is courageous. And that’s all I need to know. Michael Sam is also gay. He also enjoys playing football. When you put those two together, it’s national news. Seems rather arbitrary. I love sports. But I also see how sports can be meaningless in the grander scheme of life. A man throws an oblong ball and another man catches it. The world continues on outside. Nothing is changed. I sit on my couch and take it all in. Three hours pass. The game is over, but I’m still the same. But then again, sports and the outside world meet more than we ever could have intended. These meetings force us to confront issues most would rather just ignore. When a kid pushes a fan. When a team chooses not to play. When a man discusses his sexuality. This isn’t in the rule books. There isn’t a protocol for how to handle the times when the outside world comes knocking. Yet, we always have to answer. These games may not fix anything. They won’t provide a solution to the problems they illuminate. But they do provide a spark for conversation, a medium through which we can discuss race and sexuality and more. So while sports may not necessarily change anything, they do provide a catalyst for conversations about change. Maybe these games aren’t so meaningless after all. Very well written and well thought out. The only difficulty is meaning is an arbitrary opinion. What is meaningful to you may not be meaningful to me. Enjoyed your post and agree with many of your opinions.